“……… It’s true I’ve been so crazily busy with ceremonies this year that I haven’t had time to blog but I’ve gleaned tons of creative ideas “. “So here I am with my first story”. 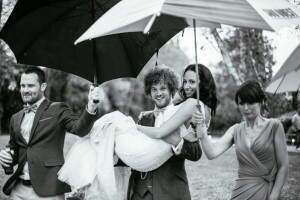 1) Tom and Fiona’ May wedding at http://www.luxuryweddingsinfrance.com was literally the wettest day of the year!! Let’s be honest one doesn’t expect to invite a hundred guests from all over the world to South West France for a wet wedding! When I arrived at the venue the poor bride was in slight melt down as the weather report went from bad to worse .She was determined to have the ceremony outside. One thing I have noticed in the wedding trade is that ‘Where there’s a will there is always a way!”………… Especially if one has a wedding planner ! They are worth their weight in “gold”! Wedding planners seem to be a very special breed . 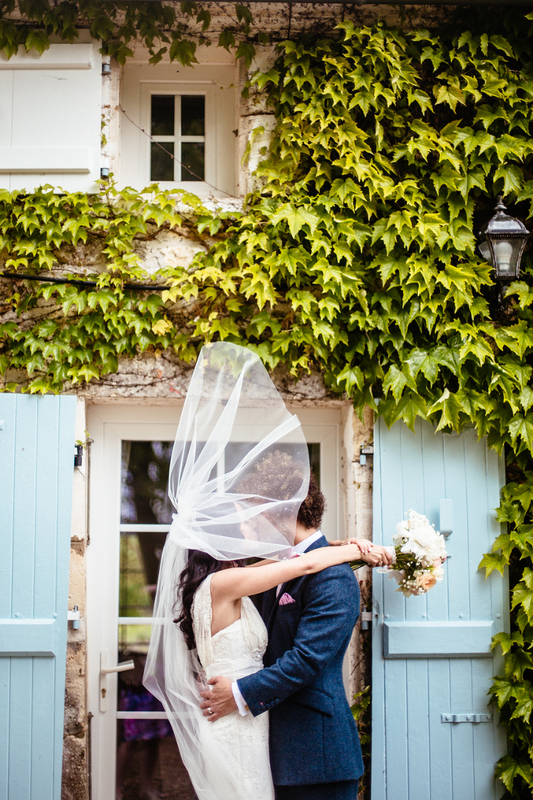 They’re prepared to go into ‘life or death” mode to make everything happen smoothly …………and when the elements dictate a change of plan ” I’ve seen wedding planners literally perform miracles at the cost of an excruciatingly high stress level! This is not a job for me I must admit. Not only because I’m a slightly dis-organised person but because my job is to be serene and calm on the day. The team spent a couple of hours erecting a last minute marquee .The sides were left off so it provided only roof cover and the show went on ………………………….. 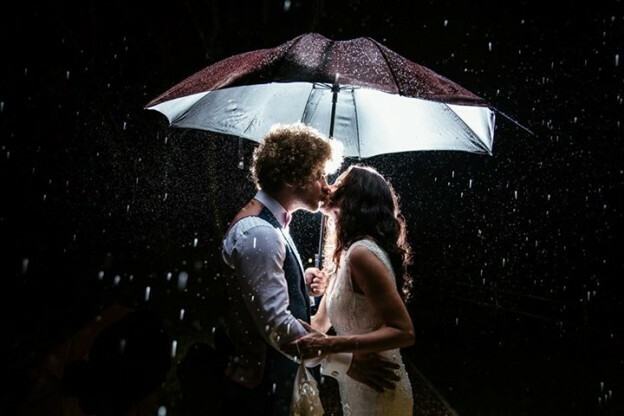 The horizontal rain blew in mercilessly and everyone huddled together in the middle at first until I announced the arrival of the bride …………..
Quite amazingly the aisle appeared like the path through the “Red Sea ” as everyone made room for Fiona’s procession . Women, men, children and babies moved out to the sides and accepted they were going to get wet. We all got soaked to the skin but hey, it was wonderful!! The photographer www.cassandralane.co.uk found it tricky to keep her gear dry so a couple of ushers followed her around with umbrellas and a groomsman held an umbrella over my head throughout the ceremony.Her photos were superbe! The singer/guitarist who had a good amplifier serenaded us from afar in a dry barn and everyone was bear- legged, bear – armed and bear-foot by the end of the proceedings. So I have a small amount of advice on this subject. 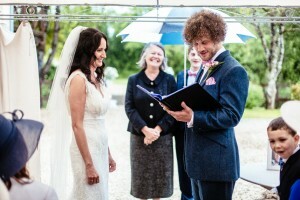 1) Employ a wedding planner.2) Make sure you have plenty of umbrellas (very useful if it’s horribly hot too!) 3) Plenty of small bottles of water.4) Advise your guests to have a change of clothes for the day . 5) Ask your photographer/videographer to show you work they’ve done in the rain. 6) Make sure your venue has a plan “B”. 7) Ask the band about their plan “B” if they’re using electric amplification and think about how much room the musiciens take up if they can’t be outside. Their instruments can’t get wet either! Harps and pianos take up a huge amount of room! 8) My husband and two sons are wedding musicians and they always have a large plastic tarpaulin at the ready to throw over their gear in case! Seems obvious but you’d be amazed how many suppliers are ill – prepared. All that having been said it’s definitely rare in Southern France for it to rain between the months of May through till September. In fact, in June,July and August it is the heat which can be a real enemy. This last summer of 2015 I performed about 20 ceremonies in close to 40° temperatures. It was a real ordeal . I am always surprised that even though the venues invariably have swimming pools the wedding day, no matter how hot never seems to feature them. A fully- dressed pool party would be my plan “B” without a doubt!